You have probably heard of, or even are using, the free credit score service from Credit Karma. 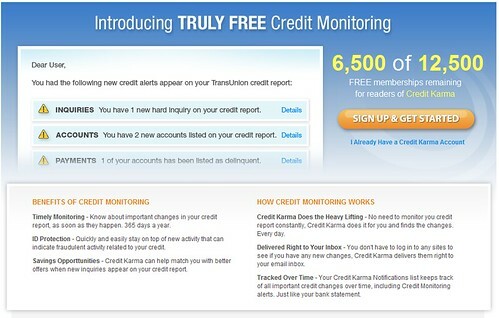 But do you know that Credit Karma also has a credit monitoring service? If you don’t, then here’s your chance to sign up for the service for free during their Free Credit Monitoring giveaway. 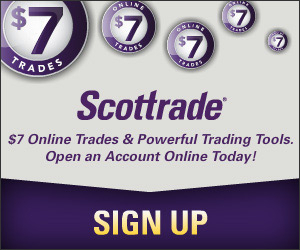 Be one of the first 12,500 users to sign up and you will get the service for free. I just signed up myself, so obviously I haven’t received any alert yet about how my credit has changed. But from the description, it seem that every time when there’s a credit score change, or a hard inquiry on my credit report, or a new account has been added to the report, I will receive a email notice from Credit Karma about the changes that could affect my score. I have never used a paid credit monitoring service before, though I have more than once considered getting one, so I don’t know exactly what are the differences between Credit Karma’s free service and those paid ones. But I think getting timely alerts about changes on activities on my credit report is all I need now. After all, I am getting a monitoring service, not a prevention service. So from the first look, it seems that Credit Karma’s free credit monitoring service should work alright for me. If you are not familiar with Credit Karma, basically it gives credit score to its customers for free. But beware that the credit score from Credit Karma is TransRisk score from TransUnion (Credit Karma is also offering VantageScore), one that’s considered as one of the FAKO scores (see other credit score types), not the authoritative FICO score that most creditors use to judge your credit worthiness. Despite that, I have been using Credit Karma for a few years, and I am pretty happy with what I got so far. Even though the score isn’t a FICO score, it does show the change of my score, which basically reflects those events that occurred over the time. And best of all, I pay nothing for the score and now the credit monitoring service. So if you are interested in getting the credit monitoring service from Credit Karma, you can get now for free during their giveaway. As you can see from the above screenshot, there are still free membership available at the time when I signed up. All you need to do is first join Credit Karma for free, then use this link to sign up for the free credit monitoring service.